Is this product strong enough to remove blood from whelping sheets? Can I get 12% or 40 volume in this gal size? does spaying hydrogen peroxide on moss, kill it? Is it a good treatment for moss removal on sport courts which have a vinyl-plastic surface. Will it stain or leave a residue which would be difficult to remove? 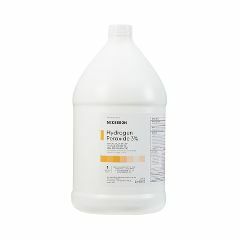 Hydrogen Peroxide has been used to kill moss on roofs, but it must be a higher concentration(20% - 35%).Once the moss is killed, they pressure wash the roof. I don't know whether or not it will stain the surface, but I have read where a 3% solution was used to remove ball point pen from vinyl upholstery. Is this solution "Food Grade" H2O2 ? I will say yes to this question. No, 3% is the standard grade for H202. Food grade Hydrogen Peroxide is 35%.